After letting you guys in on my latest health kick I’ve had a few questions about the Ketogenic diet (full post coming soon on that one). Long story short, this diet pretty much means no carbs, which means snack options are very, very limited. Anyone with remote access to the outside world knows the overwhelming benefits of kale, but it’s not exactly the tastiest veggie on the planet. I decided to try my hand at making some crispy kale chips, and – whilst they might not taste as good as my usual fat-packed potatoes of choice – they definitely help with my cravings! 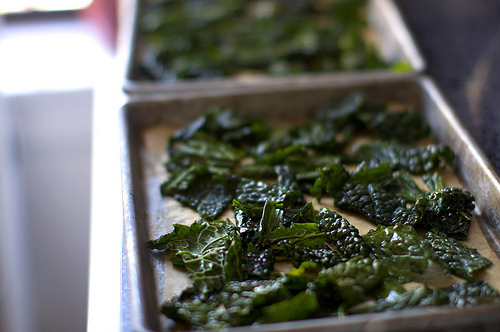 Wash your kale and leave it to dry. If you’re impatient like me you’ll just empty the bag straight away, but I’d definitely recommend giving it a rinse before hand. Make sure your kale is completely dry before you move onto the next step, otherwise it’ll pretty much shrivel in the oven! Next go through the leaves (yes, all of them) and pick out all of the large stalks. It may be time consuming, but you definitely don’t want to be munching on gooey kale bits later on. Trust me on that one. The next thing to do is to coat your kale in your oil of choice. Personally I like to use coconut oil, which I warm up by rubbing between the palms of my hands (it’s also really good for your skin, score!). To coat the leaves I dip my oil-covered hands into the bowl and rub them around to make sure every piece of kale is fully covered. Now it’s time to add your flavourings. You can pretty much add anything you want, but my personal favourite is a pinch of sea salt with some balsamic vinegar. I’ve heard parmesan cheese chips are excellent. Mm, cheese. Spread them evenly over across a baking tray, making sure that they don’t overlap and drench them in your toppings! Now it’s time to get cookin’. I’ve found that settings generally vary when making these little guys, but I’d say the best temperature to start off with is 180 degrees, as it cooks them quick enough (so that you don’t drool all over your floor) but also lets you keep track of them too. There’s a fine line between crispy kale and completely charcoaled kale, so be sure to keep your eye on them the first time around to make sure you don’t end up with a tray full of disappointment. After around ten to fifteen minutes they should be done! Now this is the hardest part of all: take them out of the oven and leave them to cool for around five minutes. These five minutes will be the toughest five minutes of your life, so brace yourselves – it’s going to get emotional. But once the five minutes are over? Get stuck in!